The 31st Annual Polar Bear Run will be January 26. The 5k, 2k Fun Run, Cub Run and Cub Dash all support the High School Choir Mission Tour of Johnson Ferry Baptist Church. This year the choir will be singing in New York City in June. The Polar Bear Run prides itself in being the coolest race in East Cobb with the miles outside and the party indoors. One of the longest running 5ks in the area, the Polar Bear Run has 2,000 participants. Polar Bear Run also boasts the favorite race shirt in Cobb County—this year will be a long sleeved, dry-fit hoodie. 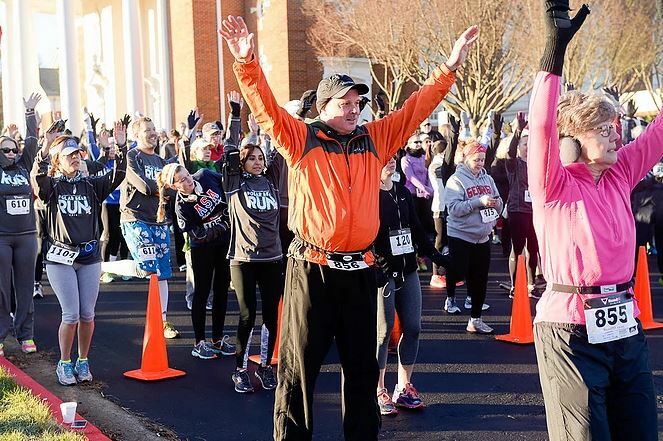 The Polar Bear Run is a popular East Cobb Race with hundreds of dedicated runners participating every year. “I have run in the Polar Bear 5K about 15 times and it is my favorite local 5K. It is well organized, has an easy fairly flat course, and the proceeds go to help support our local high students who have an impact for God’s kingdom around the world. I love seeing the students and parents along the course cheering and encouraging participants no matter how cold the temperatures are,” says Lauren McCook. “I just love the Polar Bear race! This will be my 6th year doing the race with my Team Sparkle! We love how friendly and well organized it is! The course makes it fun for everyone to bring their families! And getting the opportunity to support high schoolers going on mission is the best feeling ever! So, we can say that it is a WIN WIN all the way around!” says Jacynta Harb. The race takes place at Johnson Ferry Baptist Church, 955 Johnson Ferry Road in Marietta/East Cobb. For more information and to register for the 31st Annual Polar Bear Run, visit polarbear-run.com. This article originally appeared in the January issue of EAST COBBER, on page 37. Click here to view the digital edition.